August Grisebach (1814-1879) was a German botanist and professor born in Hanover. 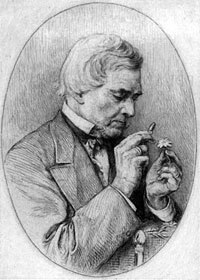 He studied medicine and botany in Göttingen and Berlin, where he finished a doctorate in 1836. Grisebach was later professor for natural history at the University of Göttingen and director of the botanical garden there. In 1839 he undertook an extensive tour from Germany to Bursa in Turkey and returned via the southwestern Balkans. 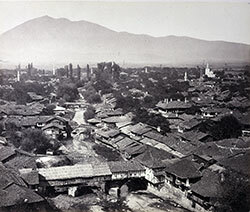 Proceeding from Skopje to Prizren, he discovered that the Ottoman authorities would not allow him to carry on northwards to Bosnia, so he set off for Shkodra through the mountains of northern Albania, a region rarely visited by foreigners. The following are excerpts from this journey, taken from the book “Reise durch Rumelien und nach Brussa im Jahre 1839” [Journey through Rumelia to Bursa in 1839], published in Göttingen in 1841. The town of Prizren stretches picturesquely along the mountainside for half an hour. It counts 30 minarets and makes such a grand impression that one would think it more important than Salonika. It has only 20,000 inhabitants, who live in miserable conditions. Of the estimated 4,000 houses, 500 of them are inhabited by Greek (1) families and 3,500 by Albanian families, most of the latter having converted to Islam. Albanian is generally spoken here, but there is also a good deal of Turkish and Greek. As to the name of the town, it is usually called Prizdrén, but one hears many other variants such as: Prizdra, Pizdra, Pizdren, Pizren, Pizra, Pizrend, Pizdrend, Prizdren and Prizrend. I found the variety of pronunciations, a normal result of the different languages spoken and of the fact that most of the inhabitants do not know how to read and write, rather intriguing because it reflects the variety of written forms often given for cities in the Orient. For this reason I listened to the pronunciations carefully and tried to write them down as accurately as possible. To avoid errors and misinterpretations that could arise from this state of affairs, geographers would be well advised to listen carefully to the sounds of the native languages and then try to come to an agreement on the right historical form. Despite the bad condition of the trail connecting Prizren to the Adriatic coast, there is a good deal of commerce going back and forth. On my journey through the mountains I passed 300 laden horses altogether, most of which were carrying western European goods from Scutari to Prizren and Rumelia. 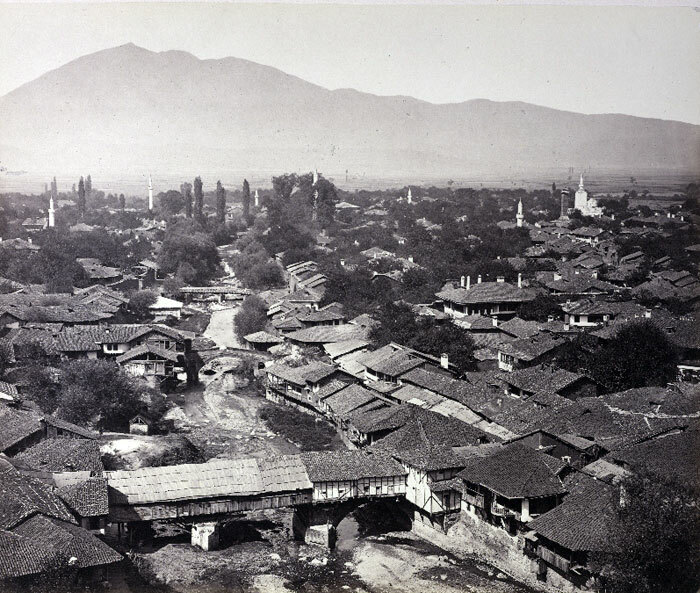 Merchants told me that traffic here was just as important as it was on the route from Belgrade and Alexinitze [Aleksinac] to Üsküb and Bitolia [Bitola]. The strange thing here is that, although travellers are warned by everyone about the Albanians, the trade route from Prizren to Scutari is relatively safe. I was told that one could travel with one’s “cap inside out”, i.e. in strange foreign clothing, without being molested in the least. One only needs to take care not to leave the trail, because bullets fly on both sides of it. There have been no cases of highway robbery here for some time. On one occasion, I saw over 40 laden horses together in a caravan that was only guarded by a very few Turks. Six Albanians could have seized the whole lot with ease. The reasons they do not are as follows. Firstly the goods, mostly manufactured wares, are of no particular interest to the mountain inhabitants. Secondly, this northern Albanian trade route is commercially far too important for Turkey, such that the Turks would keep it open at any cost. If the goods did not reach their destination, merchants would be forced to put together larger caravans and have them escorted by troops. The Albanians understand this and prefer to ensure the safety of the convoys of goods themselves, instead of having large numbers of Turkish troops pass through their territory, from whom they would no doubt suffer serious repercussions. 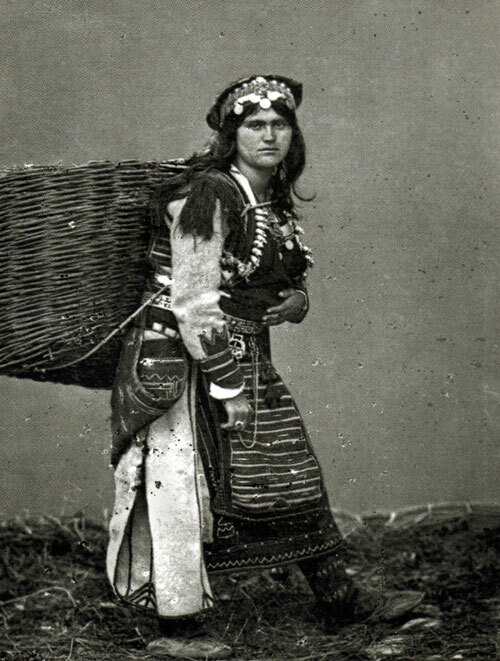 My information on the territory of the Albanian tribes in Dukagjini stems from the tribesmen I met in the hans. They call themselves and their land “Dukagjini” and when I asked about Mirdita, they pointed to the southwest. However, one must distinguish the tribes of Dukagjini that inhabit the region from the Turkish sanjak of Dukagjini, which would seem to cover a much larger territory and comprise numerous, more or less independent tribes, some of which are Slavic. According to Hadji Chalfa, (4) it covers most of highland Albania, from Montenegro to Elbasan. This writer (page 145) includes in it the settlements of Podmila and Pulav [Plav] in Bertiscus, Ipek and Jacova [Gjakova] on the plain of the White Drin, and Alessio [Lezha] and Zaderima [Zadrima] on the plain of the Drin estuary. The mountains in-between are mostly ignored, perhaps because there are no towns there. A further reading of Hadji Chalfa’s text reveals that his Dukagjini borders on the sanjaks of Prishtina, Prizren, Ohrid (including the region of the Mat River), Scutari (including Montenegro) and Bosnia. Since this wider definition of the term Dukagjini does not seem to be known to the Albanians, I have used the word in its more restricted sense, as explained in the text. One thing is certain - the Dukagjini tribes regard themselves as different from the inhabitants of Bertiscus, as they do from the Albanians of Zadrima at the estuary of the Drin, and from the Mirdita. What has been entered on maps about this region or is to be found in geographical source material is mostly vague or inaccurate. My conclusions here, however, should only be regarded as tentative. The Dukagjini tribes through whose territory the trail leads, inhabit the northern part of the mountains known as the northern Albanian diabase range, that stretches from the juncture of the two arms of the Drin River for a distance of 22 hours to the ferry at Scala, not far from Scutari, and southwards to Elbasan. To the north the mountains border on the united Drin River. The water divide to the south of this river constitutes the frontier between Dukagjini and Mirdita that encompasses the watershed of the Matis or Mat River. East of Mirdita is the territory of the Dibra tribes that stretches northwestwards to the border of Dukagjini territory. On the Bertiscus slopes on the other side of the united Drin River live the Latins, a name used, in Prizren too, for the Catholic Albanians. The Mirdita tribe is also faithful to the Roman Church, whereas the Dukagjini tribes, like the Albanians of the Scardus mountains have become Muslims. Dukagjini can be divided into several districts that are ruled over by local chieftains. They and their subjects have a low level of education. I met one of them who was also the proprietor of a han and lived more or less like the local Albanians, as a village mayor would live in our country with his villagers. He must pay tribute to the pasha. This is the maximum extent of Turkish influence in the region. The imperial crown, however, profits from the masses of energetic young men in this densely populated region as they volunteer to serve in the army. The political relationship between the mountain tribes of northern Albania and the authorities of the pashalik is most clearly to be seen in the above-mentioned campaign of Ismed against the Latins. I was told in Dukagjini that the Albanians living there paid tribute to the pasha of Prizren, but that the Mirdita tribesmen were completely free, as were the Montenegrins. There would seem, at any rate, to be different degrees of independence among the various tribes. With regard to the form of rule among the tribes, though I have no reliable information about this, there is at least a fundamental difference from the situation among the Montenegrins. The latter regard the Vladika as their sole ruler, whereas among the Albanians, each tribe (there are for example seven tribes in Dukagjini) is under its own independent chieftain. I do not know whether these persons are elected, what power they have, or what influence religious authorities exert over them. I, however, believe that they are not very much influenced from outside and that a captain is not much more than a man of repute under whom the tribe unites in time of war. There is, in fact, not much to rule over in a region where every man defends his property with his weapons and regards his personal freedom as the greatest good. There are no towns in Dukagjini and they have no commerce. They have enough ammunition and thus have no great need of money. They live off herding, and they grow corn wherever the narrow valleys offer a bit of flatland and wherever the mountain ridges have flat plateaux. In this region, one sees a few villages to one side or the other of the trail. More often, however, one sees isolated houses in the mountains. The hans are simply built, similar to Bulgarian farmhouses. Some of them consist simply of one-storey stables with a covered, open area outside for the sheep. I never saw food in any of them, except for a type of bread, tainted wine and a sort of drink made of whey in which little pieces of cheese are floating. Usually there was nothing to be had. The water was of excellent quality everywhere. One time, I saw them making a no doubt terrible tasting cake of corn and sour milk, a type of polenta. Almost everything the people of Dukagjini eat is made of sour milk. 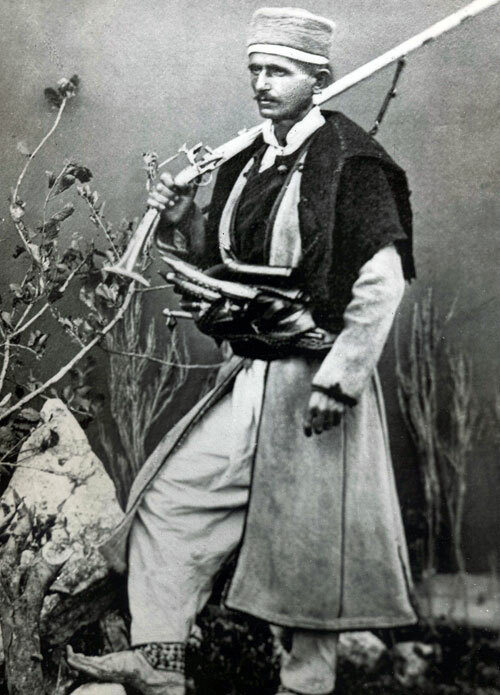 No Dukagjini tribesmen wear shirts, but they all have rifles. Their clothes are completely different from the colourful costumes of the inhabitants of central and southern Albania. All that the Dukagjini tribesmen wear is a jacket (that was originally white), a short robe made of coarse wool, a red belt with two pistols at a slant over one another in it, leggings that go right to the knees, stockings, footwraps around their feet instead of sandals, a red fez and a musket. One sees their bare chests and their tanned skin protruding between the belt and the leggings. Their faces are coarse and ugly and the colour of their skin goes from yellow to something approaching black. Since they never change their clothes until they fall off, most of the garments are in rags and make them look like beggars. Their firearms, on the other hand, are in perfect condition. Their pistols are often inlaid with silver and are all the same size. I only ever saw women on the trail. At home, they are locked up or hidden from the view of passers-by. Aside from the square cap they wear instead of the red fez, they are dressed almost like the men. Under their jackets they wear a chest cloth to cover their breasts, and over their leggings, they have a dark red apron with fringes. I saw children up to the age of 14 going naked in the fields. They came up to me to beg, something that the adults never did. On the contrary, the adults all behaved proudly, kept their distance and seemed mistrustful. The Turkish soldiers accompanying me did not treat these Dukagjini tribesmen with their usual haughtiness and derision because they were afraid of them. It was well known, as they said, that these savage sons of the mountains were extremely touchy and would immediately start firing their pistols, not only at foreigners but at one another. Dimitri once said to one of the handjis: “You are a wretched people indeed, you have nothing at all!” The Albanian replied: “But the travellers bring all of their provisions with them!" When the interpreter translated what was said about their poverty and wretched state, one of our otherwise so indolent postillions called out to him in a language the tribesmen could not understand and told him not to speak in such a tone of voice because it was very dangerous. However, I never saw any sign of envy, dissatisfaction, greed or servility among them. The strangest thing is that money is of no value to get them to work. I offered a fellow a piaster to get me a jug of water out of the gorge, 200 paces away, but he would not do it. One of the Turks then gave him some gunpowder to do it. He hesitated for a moment, then took the powder and ran away, without bringing any water back. It is commonly said that they are all murderers and thieves. “Woe to the foreigner,” say the Turks, “who encounters them alone in the mountains. They will shoot him without the slightest hesitation.” One would think that such customs, where passions are unbridled by native temperament or a government, would drive a people to doom, if it were not tempered by a strong feeling of honour and by blood feuding. No one is interested in who gets killed in the mountains. Every home is an asylum, in which the guest or anyone who happens to be there, is under the inviolable protection of the owner. Were a murder to occur in a han, for instance, the handji would storm out of the house immediately and would not return until he had slain the murderer. If he did not find him, tribal custom has it that he would have to wander for the rest of his life until he did, and his property would be given to his heirs. Such laws or customs at least guarantee travellers complete safety at night. Similarly, one could no doubt travel anywhere in the mountains if one put oneself under the personal protection of an Albanian, something that could be done with letters of recommendation from a clergyman educated at the Roman Catholic Jesuit college in Scutari, and if one learned the Albanian language. If an Albanian could be persuaded to take on such responsibility one way or the other, I have no doubt that he would stay with the traveller all the time and defend him with his honour and his life. (1) Grisebach uses the word Greek to refer to the Slavic Orthodox population, i.e. the Serbs. (2) The term Resna is used by the author refers to the Lumbardh/Bistrica River. (3) The term Bertiscus, stemming from the map of Ptolemy, refers to the northern Albanian Alps, also known as the Bjeshkët e Namuna or Prokletije (the Accursed Mountains). (4) Chadschi Chalfa, author of Rumeli und Bosna [Rumelia and Bosnia], Vienna 1812.